By having backups of data and critical systems in the cloud, your business can maintain its operations even after a major IT failure. Given that data is the new oil of the industry, ensuring that it’s carefully stored and maintained has shot up the priority lists of many businesses. The value of data, the heavy fines and reputation damage that come with its improper use or protection, means businesses need to carefully consider their data management and disaster recovery strategies. 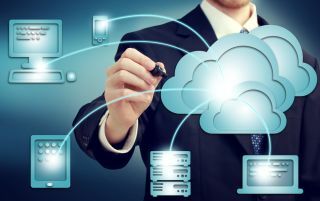 Where it was once fine to have a backup server to keep a business ticking over while the main system got fixed, the need for near continuous data collection, access and storage, means there’s a need to tap into the cloud. This might seem like an IT problem initially, but a cloud-powered disaster recovery network can yield business benefits and give companies a competitive edge over their rivals. Under the doctrine of digital transformation, many companies are moving from legacy and on-premise IT systems to embracing digital and cloud based services. The benefits of such a move are clear; a reduction in IT costs, more agile infrastructure, support of remote working and reducing the workloads of in-house IT teams. Given the falling costs of such services and the amount of investment that has been funnelled into data centres, infrastructure and security, it’s tempting to throw all your company’s database systems into a public cloud and be done with it. It’s all very well hosting your website on cloud infrastructure and making use of cloud based productivity tools, but disaster recovery and data management needs a more considered approach that will yield greater benefits. Like it or not, systems do fail, and when they do they can reduce a business to a crawl. When business’ critical systems go down it can spell disaster for a company if it doesn’t have the right backup systems in place. Say an online store’s product database fails during a peak sales time, it could result in a huge loss of revenue for the company as well as disgruntled would-be customers. Cloud based disaster recovery services are the panacea to such problems. While many systems can already be delivered through cloud power, having backups of data and critical systems in the cloud can ensure a company keeps its operations up and running even while an outage is being fixed. Simple backup systems are not good enough on their own as they just secure a record of the data rather than guarantee the means to rapidly getting up and running in the way the cloud facilitates. This not only results in the continued productivity of a company, it also shores up its reputation with its customers, partners and suppliers, potentially allowing the business to be more appealing over less reliable rivals. At the same time, choosing cloud systems for backup, disaster recovery and business continuity is likely cheaper, more secure and less time consuming than maintaining an on-premise backup. As such, a business can bolster its bottom line profits and allow its IT team to focus on technology that will help the company grow rather than keeping server lights on. Equally, having a cloud-based data management strategy helps future-proof a growing company in both the short and long-terms. For example, companies offering online services that gain a sudden influx of interest can see spike in data flowing across their infrastructure. If it cannot cope, that service is knocked offline, annoying customers and potentially costing the company revenue. The flexible and scalable nature of the cloud means compute and server resources can be easily spun up to cope with surges in demand, thereby seeing a disaster recovery become disaster avoidance. This ability to scale with demand also helps companies grow in the long-term as they can easily provision more cloud storage space and power to support growing databases, rather than need to buy and plumb in new servers. Again, this allows a company to be more productive and efficient in near real-time. While the flexible nature of cloud-based services and disaster recovery plans are apparent, the rollout of the European Union’s General Data Protection Regulation (GDPR), could stymie that. GDPR puts a greater onus on data protection, access, and location, with the latter aimed at having the data pertaining to EU citizens held within European data centres. But cloud providers operating in the EU have started to open data centres that can act as assets for customers to get their bushiness on the path to being GDPR compliant. As such, a cloud-based disaster recovery and data management setup can be transitioned over to GDPR compliant infrastructure with relative ease. Companies using cloud services to support a business and data infrastructure that adheres to GDPR are likely to garner more trust from their customers and partners than those which have yet to meet the rigours of the regulation. Furthermore, having data centres located closer to your company’s operations or headquarters reduces the latency between the data and its users. In the case of a system failure, this means a company can get up and running again faster than if its cloud backup service was located in a centre on another continent, in turn benefiting from continued productivity rather than being hampered by a slow disaster recovery. Disaster recovery may not seem like the most exciting use of cloud power, but it’s arguably its most important. At face value it may seem like something to tick-off a checklist, but taking cloud-centric approach can turn it from an IT task into something that has true benefits to a business and can bolster a company’s growth and success in spite of economic challenges and stringent.